In case you were out seeing if it was really as cold as the guy on TV said it was (it was), here’s what you missed in sports on Thursday. The New York Knicks snapped the San Antonio Spurs’ seven-game winning streak, with a decisive 100-83 victory at Madison Square Garden. “Doesn’t matter,” said Spurs Coach Gregg Popovich after the game, “just a meaningless game, in a meaningless regular season, in this meaningless march to death we call life. Right, Tony?” He then looked back at his point guard, Frenchman Tony Parker, who nodded sagely at his coach before putting out a Gauloise between his fingers. Oregon showed off its speed on both sides of the ball, beating Kansas State, 35-17, in the Tostitos Fiesta Bowl. In a postgame interview, ESPN sideline reporter Holly Rowe asked veteran Kansas State coach Bill Snyder if he felt the game had finally started to pass him by. Snyder replied, “I don’t know. We ran into a good team, but I guess I did kind of feel like Tommy Lee Jones in that movie, you know, that one?” Rowe suggested, No Country for Old Men, but Snyder shook his said, saying, “No, you know that one where he’s old.” Rowe continued prompting Snyder with films starring an older Tommy Lee Jones, such as Men in Black II and Space Cowboys, but Snyder responded, “No, I think he’s like a cop and a dad.” Rowe, visibly frustrated at this point, said, “He’s a cop and a dad in everything!” She then continued listing Tommy Lee Jones movies until Snyder realized he was thinking of Clint Eastwood. 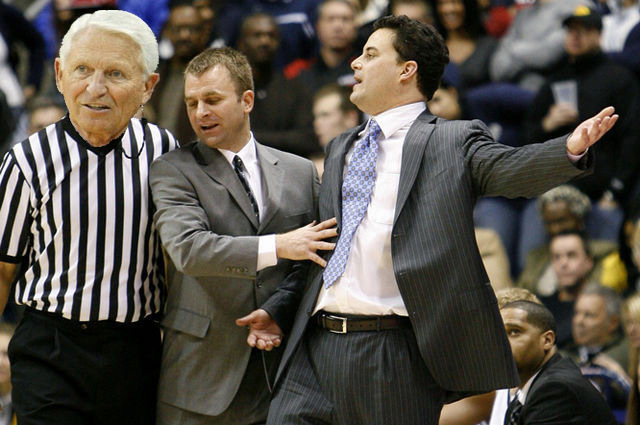 The Arizona Wildcats remained undefeated topping the Colorado Buffaloes in overtime, 92-83, after an apparent game-winning shot at the end of regulation by Colorado’s Sabatino Chen was waved off after a lengthy official review by unbiased rookie Pac-12 referee Ute Lolson. Michigan also kept its record unblemished, beating Northwestern, 94-66, in their first game of the Big 10 conference season. In response, the Northwestern student section chanted, “We’re better at football!” before falling silent, collectively shocked that their taunt was actually true. Kobe Bryant and LeBron James lead their respective conferences in NBA All-Star voting with over 1.1 million votes each, according to the league’s most recent balloting returns. Boston’s Jeff Green has received 62,367 votes, all of which came from fans who believed they were simultaneously voting for their favorite color and their favorite member of the Bridges family. Even more surprising were the seven write-in votes for D-League reserve Beau Mustard-Yellow. According to an announcement by Major League Baseball, the Houston Astros’ American League debut against the Texas Rangers will be the first game of the 2013 regular season. The announcement made no mention of a “mercy rule,” meaning those who tune in will be stuck watching nine innings of Astros baseball, much to the macabre delight of San Antonio Spurs point guard Tony Parker. Sources claim that Andy Reid is on the verge of becoming the Kansas City Chiefs’ new head coach after pulling out of a scheduled interview with the Arizona Cardinals. Apparently, the last remaining sticking point is the lack of proximate Beef ‘O’ Brady’s locations, with the nearest one to Arrowhead Stadium in Bentonville, Arkansas. “It’s just too far,” said Reid, picturing himself trying to analyze game film on an iPad while making the three-hour drive down US-71. “It’s just too dangerous.” In an effort to stave off a breakdown in negotiations, which were reported to have lasted over nine hours, Kansas City GM Scott Pioli pointed out to Reid that with the money he would earn working for the Chiefs, he could likely franchise his own Beef ‘O’ Brady location right outside of Arrowhead. Expect a deal to be announced later today. And finally, the NHL Players’ Association began another vote to reauthorize the executive board the right to disclaim interest, which clearly is great or terrible news for hockey fans, as we either can or cannot expect to see the sport of hockey played again either very soon or not at all.